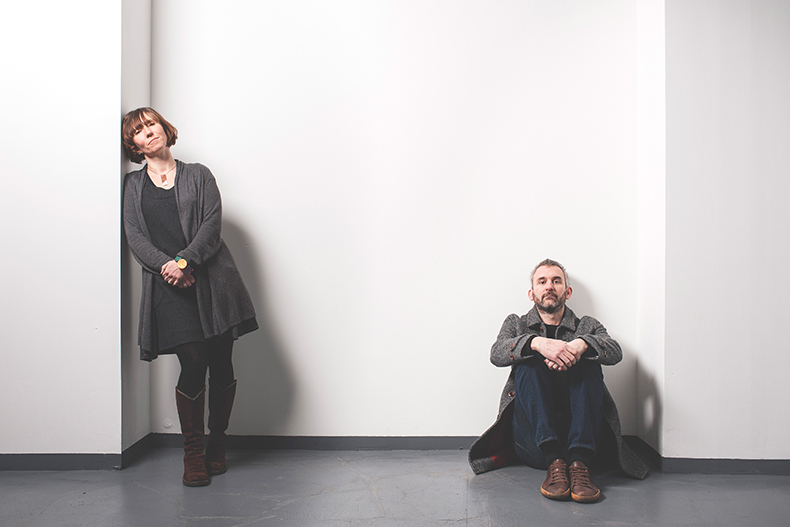 Read more about Chris and Sophie's project and their chosen vintage lights here. We immediately fell in love with the location of our traditional Cornish cottage in rural South West Cornwall and the size of the garden - we have just over an acre of land and grow a lot of our own produce. We also wanted the challenge of repurposing a traditional cottage and transforming it a contemporary family living space. Renovating a home takes time (and financial investment! ), especially when you are juggling a business and a growing family, so we are going slow. What is your and Chris’s vision for your home? Our first steps were to make it as environmentally friendly as possible as it’s really important to us as a family to try and live a low-impact life. Many of our initial steps aren’t visible: insulating the loft, installing solar panels and removing the obsolete oil-fired central heating system and aga (agas are lovely but running an oil fired engine in the kitchen all year just didn’t sit with our environmental ethos). We replaced it all with a very clever pellet boiler system - we have a hopper in the garden which is filled annually with eco-wood pellets. How have you linked your home to the garden outside? Visually our home is very much linked to the garden outside through our large windows and house plants. We were inspired by the concepts behind Margaret and Charles Rennie-Mackintosh’s rebuilt home in Glasgow where the darker more earthy spaces are on the ground floor, growing up to lighter more airy spaces above. 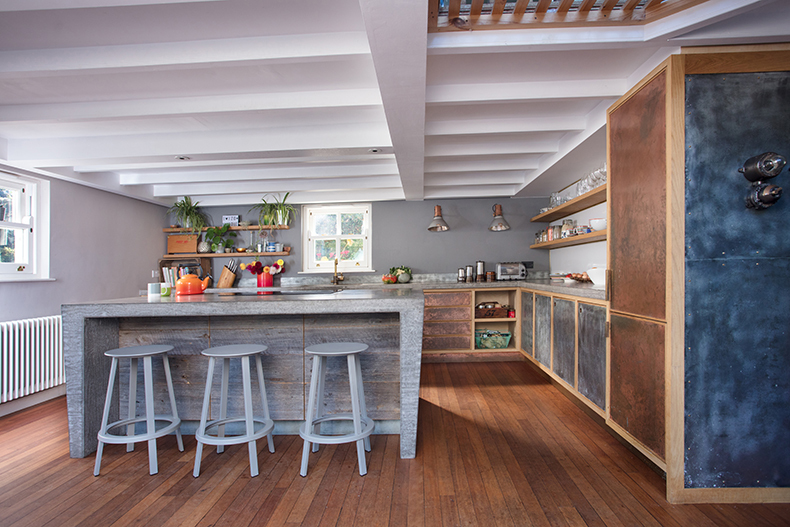 This is reflected in the reclaimed Iroco floor we have laid throughout the downstairs areas and the earthy tones of the concrete, copper and zinc in the kitchen. It’s a simple but effective framework for creating your design. What have been the biggest challenges you’ve faced renovating your home, and what have you learnt? Living in the house with two children and pets whilst renovating is definitely a huge challenge - we all lived in our bell tent in the garden for a few months whilst the kitchen was being done! When we first arrived there were four different floor levels (where the cottage had been added to over the years) and so it needed to be lowered and evened throughout. First it had to be excavated and we had long dring times as the concrete and screed was poured. We then had the same with the construction and pouring of the kitchen. All in all, it took around eight months! Our style is eclectic and personal. Chris is a minimalist, I’m probably what would be described as a maximalist, and our children also have their own interior opinions which we are happy to accommodate. As a result, our home is a melting pot of creativity. The kitchen, in particular, reflects this. 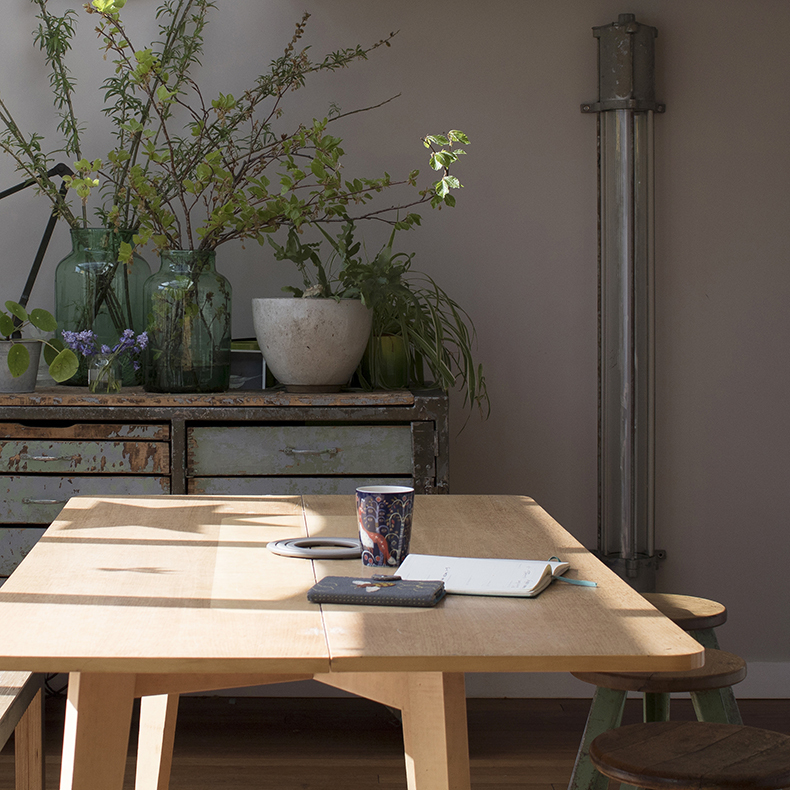 It’s a workspace - we all cook a lot - and it’s the heart of the home. You enter the house through our big french windows stepping directly into this space so you are straight into the hub of where everything happens. The colours and tones in the kitchen are linked to the outdoors, one wall is basically garden so it was important that the rest of the room reflected the garden and almost felt like part of it. 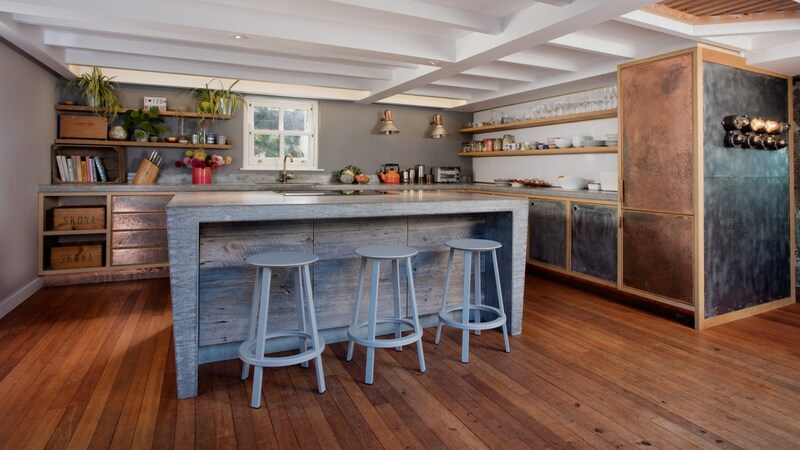 What are your top tips for renovating and designing a kitchen? Know what you need, plan and stick to your vision. One of my favourite things is the plug socket inside the central island under the countertop. It’s right beside the hob and above the integral waste system, meaning I can have power and use the hand blender and whisk exactly where I need it. Also, don’t scrimp on the details. The wood we used for the shelves is beautiful and I love it every time I see it. 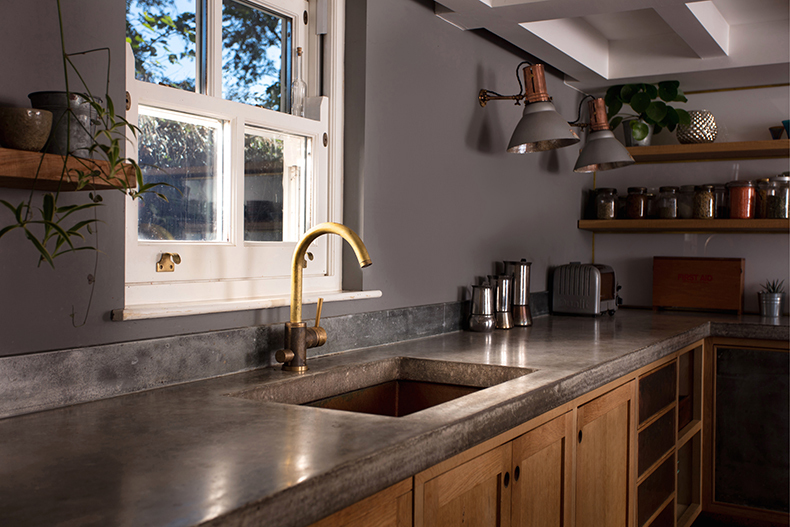 The sink tap is an Evo 184 from Swedish company Tapwell and is a pleasure to use (above). 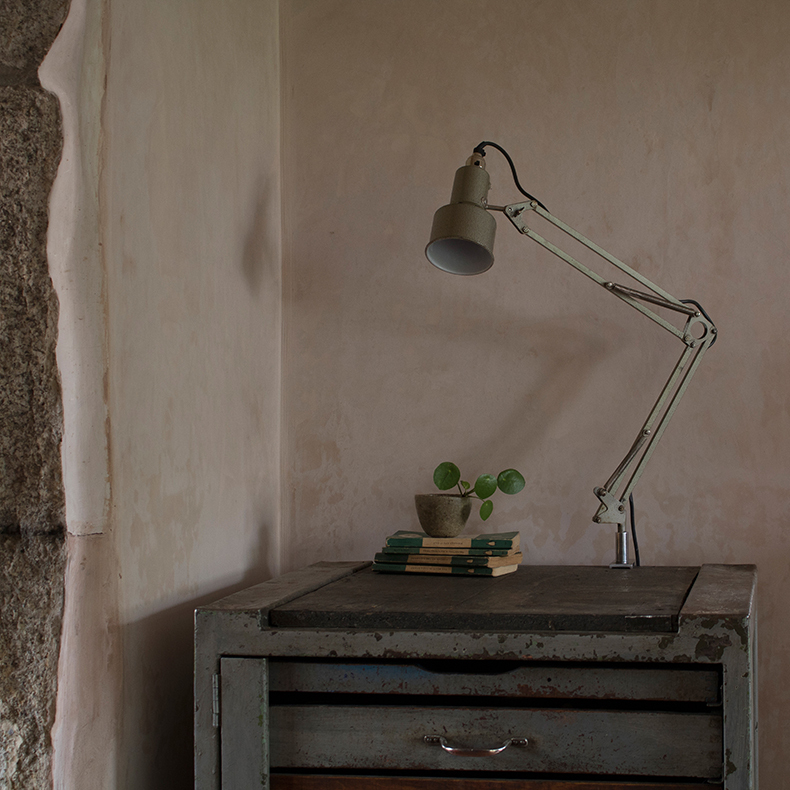 I also love the vintage GECoRAY wall lights (above) which were salvaged from a church in Surrey. They compliment the colours and textures in the space so well. In your opinion what should no home be without? We have lots of vintage lights in our home despite having low ceilings, although we’d have a lot more if the ceilings were higher! The old factory isolation switches make a fun and interactive feature lighting by the adjoining living room area and sofas (above). 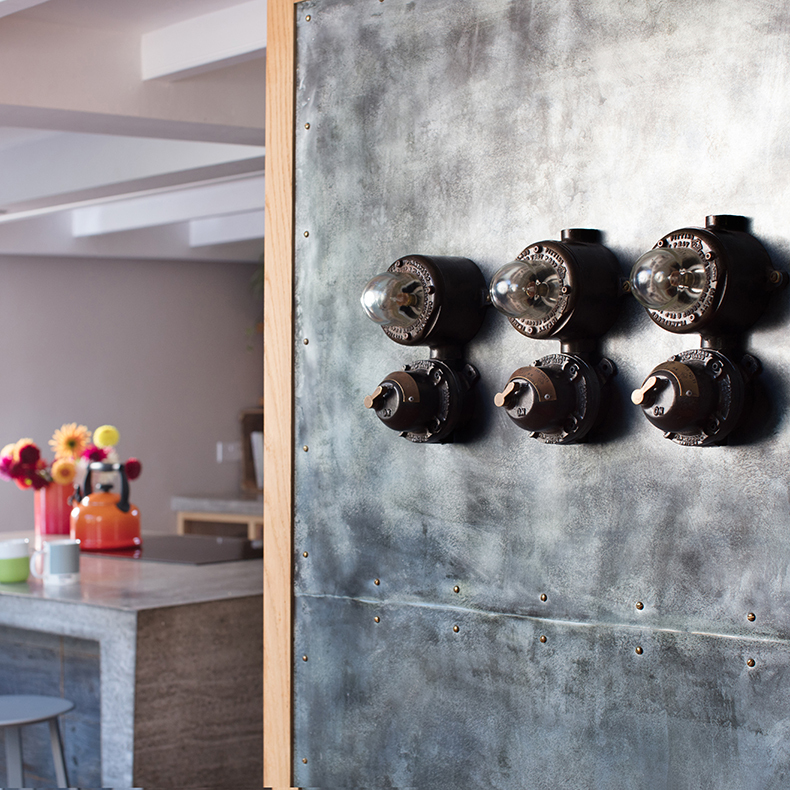 We have vintage wall lights salvaged from ships and opaline surface mounted ceiling lights. Mostly though the feature lights we use are desk, table and machinist lights. Machinist lights are practical because you can angle the light where you need it, like the Swedish Military desk light we have on our corridor console table (below). They’re also incredibly sculptural which appeals to us both. In the kitchen, we had space for feature wall lights. 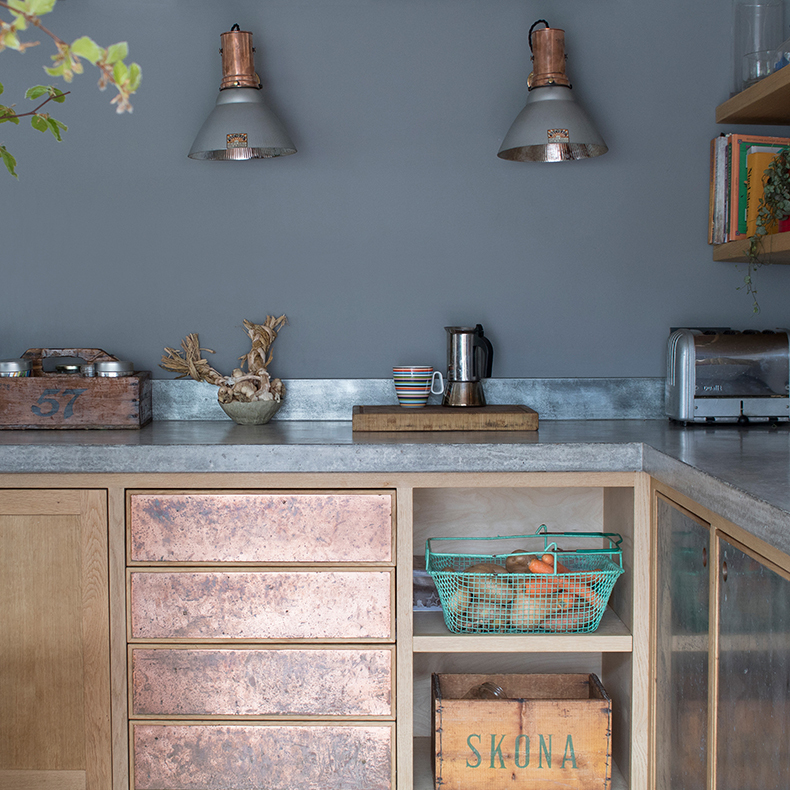 The mirrored ‘mercury’ glass and the copper of the GECoRay’s worked perfectly with the colours and tones of the zinc, copper, oak and concrete of the kitchen so were the perfect choice. That said, running a vintage lighting business means we always have new and interesting things coming through the workshops so I might be tempted to swap them soon! The next step is the family bathroom and guest shower room so watch this space!